Steve Coogan and Armando Iannucci first developed the character of Alan Partridge in the 90s for the BBC Radio 4 program On the Hour. 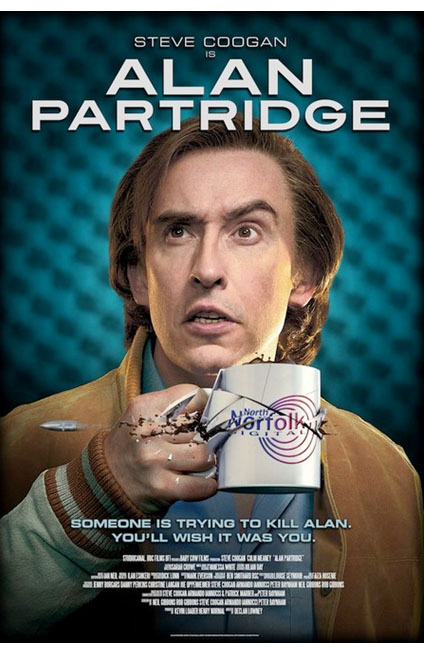 Written as a parody of media broadcasters, Partridge spawned numerous radio and television series, and makes the jump to the big screen in Alan Partridge: Alpha Papa. A film about a character with such a long history may not be appealing to the uninitiated viewer, but a lack of familiarity shouldn’t scare off audiences looking for a few good laughs. Partridge (Steve Coogan) is a DJ at a local Norwich radio station that is facing a buyout from a large conglomerate set on re-branding the station and trimming the fat. Partridge, ever the self-adoring blowhard, is confident the changes will not affect his job, but his fellow DJ Pat Farrell (Colm Meaney) isn’t so sure. He asks Alan for help in making sure his job is safe, but when Alan finds himself on the chopping block as well, he sacrifices Pat to save himself. What results is Pat going off the deep end, taking his fellow colleagues as hostages within the station, and using Alan to communicate with the police on the outside. To be clear, this is a straight up comedy. Alan is in no way a suitable negotiator, just as Pat is in no way a threatening terrorist. What results is a film comprised of some witty sketch pieces, and others merely droll, while we wait for the rather absurd plot to resolve itself. I love British comedy, the darker and crazy the better, and I found Alpha Papa to be well on par within the genre. The plot is definitely not as much of a driving force for the film as it is a vehicle for the great performances of Coogan and Meaney. Having no prior knowledge of Alan Partridge, I found much to sink my teeth into, plus an interest in watching more of Coogan’s work with the character. If nothing else, the film will succeed in broadening its fan base, at least among those with a predisposition towards the looney, without alienating core fans. Not everything in the film hits, but not everything has to. Alan Partridge: Alpha Papa opens today at the Ritz Bourse.